Hours after we witnessed the result of the 2016 Presidential Election, Hillary Clinton delivered her concession speech and gave a glimpse of hope to everyone watching, especially women. With tears in her eyes, Hillary reassured us that our fight isn’t over, even if “we still have not shattered that highest glass ceiling.” But it was her line speaking to “all the little girls watching” that has stuck with us ever since. Following her speech, the quote was tweeted through Hillary’s account and instantly went viral. Today, it’s been retweeted over 600 thousand times and has over one million likes — making it the most retweeted political tweet of 2016. 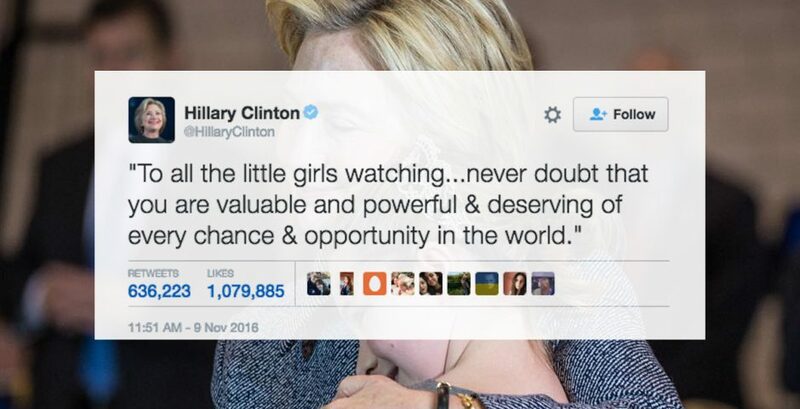 Hillary’s quote as well as her entire campaign inspired girls to be the champions they can be, and it’s only certain it will continue do just that over the next four years. At least.